Who would have thought this grocery find would be so incredibly versatile! If there's one thing we know for sure, it’s that Filipino classics never go out of style—who can resist a warm bowl of sour-and-savory sinigang? While sinigang mixes do make it easier to whip up the dish at home, there are plenty of ways to creatively cook with sinigang mixes, aside from the usual soup. Have you tried using powdered sinigang mix for marinades, glazes, or sauces yet? 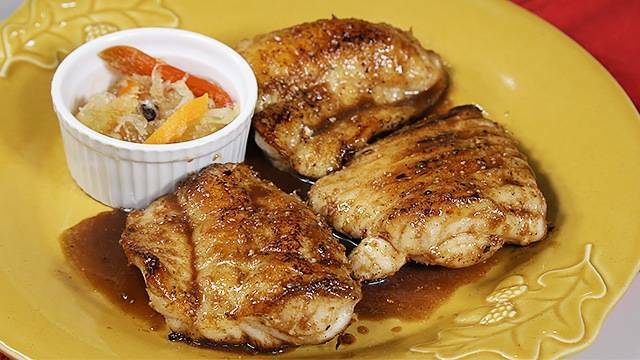 They are great ways to incorporate the iconic sour sinigang flavor into other dishes. Let loose and give these fun recipes a go next time! Simply dissolve sinigang mix in some olive oil and fish sauce and you've got yourself a tangy marinade that can give a new flavor to your usual recipes! 1 Combine chicken, fish sauce, garlic, pepper and ½ pack of the MAGGI MAGIC Sinigang. Mix well and marinate overnight. 2 To prepare the breading, combine flour, remaining half of MAGGI MAGIC Sinigang and garlic powder. 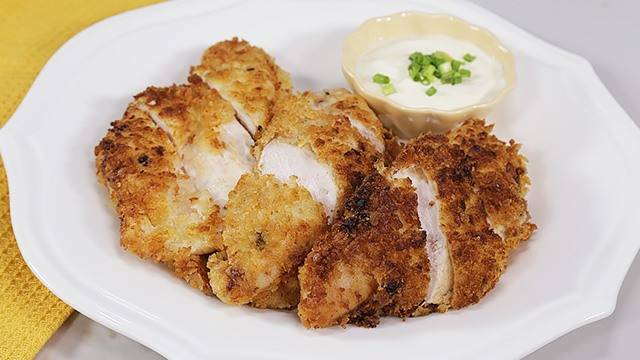 Coat chicken with the flour mixture, dip in beaten egg and coat with bread crumbs. Set aside in a sheet tray for 10 minutes. 3 Combine Nestlé All Purpose Cream, garlic, lemon zest, lemon juice and spring onion. Gently simmer for 2 minutes and season with MAGGI MAGIC SARAP® and pepper. Transfer into a serving container and set aside. 4 Preheat a large pan and drizzle olive oil. Sauté breaded chicken for 2 minutes per side. Remove and set aside to rest for 10 minutes. Cut into serving pieces. Transfer into a serving plate and serve with the sauce. 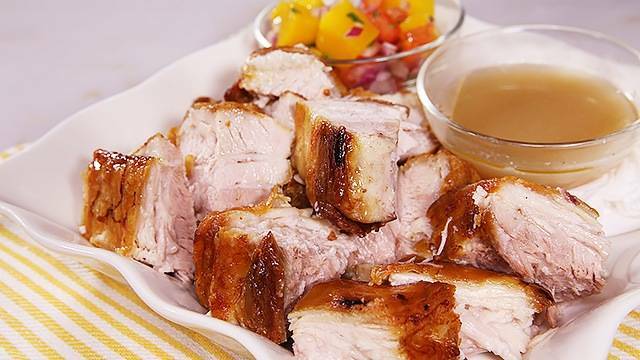 Add a new flavor to your favorite grilled meat by using sinigang mix as seasoning! 1 Combine pork belly, MAGGI Sinigang Green Mango Surprise, MAGGI MAGIC SARAP® and pepper. Mix well and marinate overnight. 2 Preheat a clean grill. Coat the pork with oil and grill pork for 4-5 minutes per side. Remove and set aside to rest for 10 minutes. Cut into bite-size pieces. 3 Combine vinegar, ginger, finger chili, red chili, sugar, calamansi juice and salt. 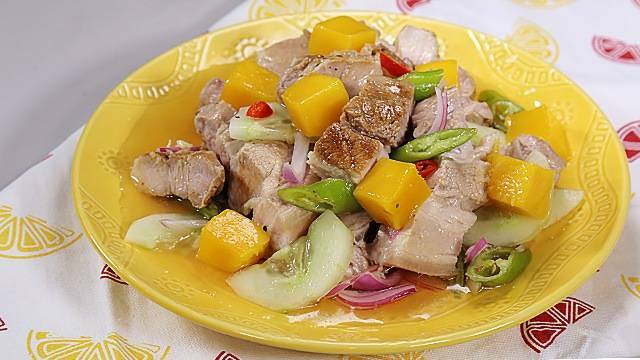 4 Assemble grilled pork belly, red onion, cucumber and mango in a plate. Drizzle vinegar mixture and serve. Need to infuse more flavor into your pork belly? If you have some leftover packet of sinigang mix, you can actually add that to boiling water along with your pork belly! Try the recipe below. 1 Combine pork, peppercorn, lemongrass, ginger, bay leaves and red onion in a small pot. Pour just enough water to cover the pork. Simmer for 30 minutes. 2 Stir in MAGGI Sinigang Green Mango Surprise, MAGGI MAGIC SARAP® and sugar. Simmer until tender. Remove pork and set aside to cool completely. Reserve cooking liquid. 3 Simmer cooking liquid until slightly thick and strain. Serve as dipping sauce. 4 Combine mango, red onion, tomato, cilantro, lemon juice and olive oil in a bowl. Season with salt and pepper. Mix well and chill until ready to serve. 5 Preheat oven at 400F. Roast pork for 1 hour or until golden brown and crunchy. Remove from the oven and set aside to rest for 10 minutes. Cut into serving pieces, transfer into a serving plate and serve with dipping sauce and Mango Salsa. Give your seared fish an extra kick with this recipe! 1 Prepare the glaze my combining MAGGI MAGIC Sinigang, MAGGI Soy Cooking and Seasoning Sauce, pepper, garlic, ginger, sugar and water in a pan. Simmer for 10 minutes. Purée using a blender and set aside. 2 Preheat a large pan and drizzle with oil. 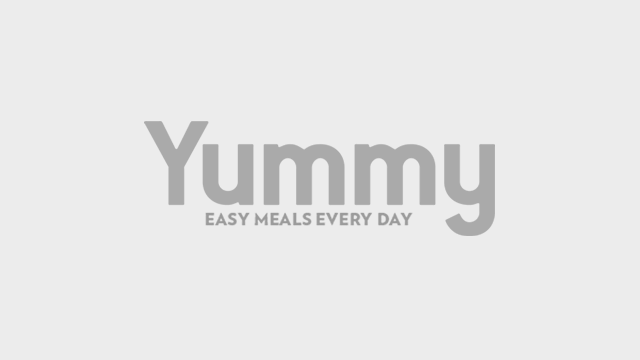 Pan sear fish fillet for 2 – 3 minutes per side. Drizzle glaze and allow to coat the fish. 3 Transfer into a serving plate and serve with atchara.